LOS ANGELES, Jan. 1 (Xinhua) -- NASA's New Horizons spacecraft performed the farthest flyby in history as it approached the Kuiper Belt object Ultima Thule on Tuesday. New Horizons made the flyby at 12:33 a.m. EST (0533 GMT) on Jan. 1, passing within 2,200 miles (about 3,540 km) of the surface of Ultima Thule at a velocity of 31,500 miles (about 50,694 km) per hour. It will provide the first close-up look at such a pristine building block of the solar system, according to NASA. New Horizons' Principal Investigator Alan Stern joined hundreds of cheerful people at the countdown center, and witnessed the historic moment for New Horizons. New Horizons has set a new record, he said, adding it will start to send back data starting Wednesday, and will continue to do so for one and a half years. 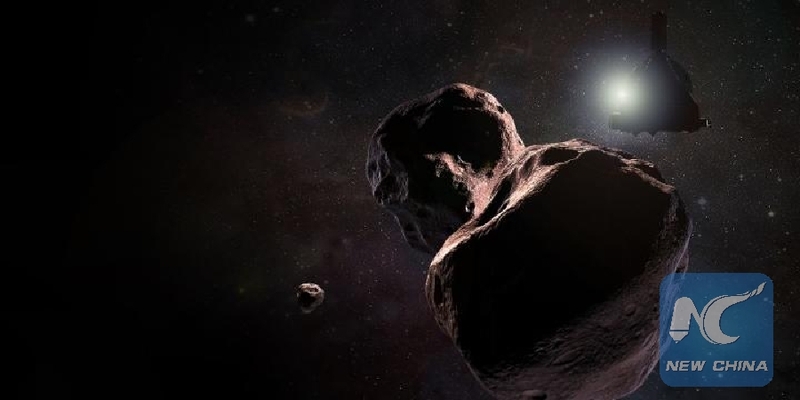 Ultima Thule, at 4 billion miles (about 6.4 billion km) from the Sun and 1 billion miles (about 1.6 billion km) from Pluto, will be the most distant object ever directly explored, according to NASA. The flyby of Ultima Thule was the first-ever exploration of small Kuiper Belt Objects, a disc-shaped region beyond Neptune that extends from about 30 to 55 astronomical units. This distant region is probably populated with hundreds of thousands of icy bodies and an estimated trillion or more comets. The spacecraft will turn a suite of instruments onto the mysterious object, and many of its mysteries will be unveiled. The New Horizons mission, launched in January 2006, aims to understand worlds at the edge of our solar system by making the first reconnaissance of the dwarf planet Pluto, and by venturing deeper into the distant, mysterious Kuiper Belt -- a relic of solar system formation. It passed Jupiter for a gravity boost on Feb. 28, 2007, and made a historic flight through the Pluto system on July 14, 2015. New Horizons was the first mission to study Pluto and its system of moons, according to NASA. The Johns Hopkins University Applied Physics Laboratory in Laurel, Maryland, designed, built and operates the New Horizons spacecraft and manages the mission for NASA's Science Mission Directorate.